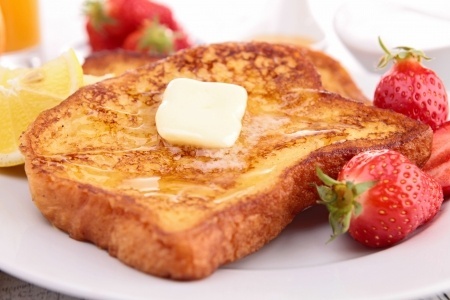 Wonderful French Toast recipe...for best results use a loaf of day old sour dough bread sliced into 1/2 inch slices. MIX ingredients together in large bowl with a flat bottom. SLICE a loaf of day old sour dough bread into ½ inch slices*. SOAK bread slices for 3-5 minutes in the egg mixture. PREHEAT a griddle and cook slices for 1-2 minutes per side (or until golden brown). SERVE topped with nonfat vanilla Greek yogurt, fresh sliced strawberries or other fresh seasonal fruit (blueberries, peaches, papaya, etc), and a dash of maple syrup. NOTE FROM NANCY: Always use the best bread you can afford when you make this recipe. Sour dough makes a fabulous French toast, but a hearty whole grain bread is also a great choice. Support your local bakeries.